REMEMBER TO PALPATE CRANIAL SUTURES OF EVERY NEWBORN AND GROWING INFANT. DO THE ABOVE IN PARTICULAR IF THE SKULL IS DEFORMED. Abnormal or premature fusion of cranial sutures is relatively common and for the most part can be detected by palpation of an elevated ridge. If undetected, it may be a cause of elevated cranial pressure. Among the earliest interventions was trepanation, now largely replaced by neuro-surgical interventions to relieve cranyosynostoses. In any case, let the images remind you to prevent trepanations. 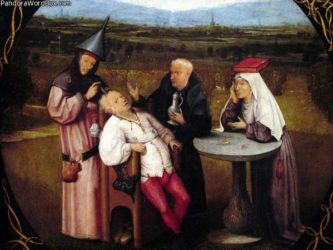 Trepanation has been performed at least since 7000 BC for the main purpose to bore a hole through the skull bone to reach the meninges and relieve increased cranial pressure – that is until religious nuts decided to use trepanation as a ritual. The upper image is by a painter sponsored by Phillip II of Spain. The irony is that his son (Carlos de Asturios) also had to undergo a trepanation performed by Andreas Vesalius, a worldwide famous physician. 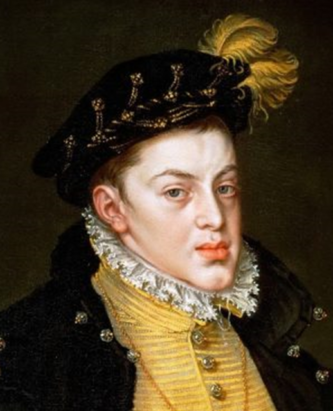 Carlos died two years later in 1568. What else do you see in the images of Carlos? Does he have a Habsburg facies? Does the Habsburg gene mutation impact cranial sutures?